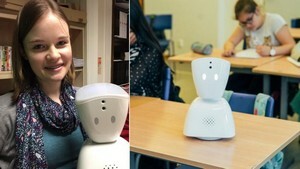 chat to friends through her remote robot. Zoe Johnson, 16, hasn't been to school since she was 12. She went to the doctor in 2014 "with a bit of a sore throat", and "somehow that became A&E [accident and emergency]," says her mother, Rachel Johnson. The doctors diagnosed myalgic encephalomyelitis, ME for short, also known as Chronic Fatigue Syndrome - a debilitating illness affecting the nervous and immune systems. But "over the years her real-world friendships disappeared because she's not well enough to see anybody," says Ms Johnson. For the last three months, though, she has been taking classes alongside her former classmates using a "telepresence" robot called AV1.